Two 24" x 36" snap open frames adorn the stand along with two literature trays! 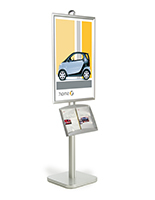 These poster stands engage customers! These poster stands are 8 feet tall with two 24"w x 36"h snap open frames and two literature racks. Create attention with your message! Poster stands, also known as sign holders, are built on a sturdy, brushed aluminum frame with a wide and stable base. The poster frames and print media trays are height adjustable along the height of the display stand poles. These Poster stands have a sleek European design. The poster stands are double sided and best suited for indoor venues such as entryways, lobby areas, convention centers, large retail spaces, hotels and shopping malls. 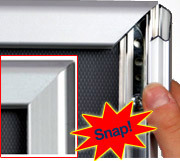 Two snap poster displays make frequent sign changes simple and quick. Just snap open all four frame sides, place the ad graphic beneath the clear plastic lens and snap the frame sides closed - done! Non-glare clear PVC plastic lenses are provided to protect your poster media. Installation and height adjustment of the graphic and brochure holders are acoomplished easily with screws on the connector plates behind the frames and trays. These poster stands work best in large, crowded areas with high pedestrian traffic like exhibition halls, universities, banks and retail stores. 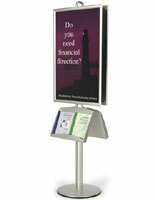 These double sided poster stands ensure maximum exposure of your advertising materials. Note: When the poster frame and metal trays are at their highest adjustment, the height of the bottom of the lower metal trays are 24" above the floor.